The application of Global Navigation Satellite Systems (GNSS) in the earth sciences has become commonplace. GNSS data can be collected rapidly and compared in common reference frames. Real-time kinematic (RTK) GNSS methods enable the rapid delivery of high-precision, high-accuracy (+/- 2 cm) positioning information to field scientists. This unit focuses on the design and execution of kinematic surveys, emphasizing the benefits and limitations of the technique. Students will learn which research questions the technique is most applicable for, as well as the standard data processing techniques. Students advance their understanding of GNSS through a technical knowledge of kinematic GNSS surveys. This unit prepares students to design and implement a survey of their own through hands-on instruction and demonstration of real-time kinematic (RTK) or post-processed kinematic (PPK) techniques in a field setting. Undergraduate students use GNSS to reoccupy a survey benchmark. Students are able to design and conduct a simple survey. Students are able to post-process base station data and correct rover positions. Cognitive: Field demonstration of equipment teaches students the system components, their interactions, and the design of optimal kinematic GNSS surveys for a given problem. Behavioral: The teacher leads students through the assembly and operation of a kinematic GNSS antenna, receiver, radio, and data post-processing. Affective: Teachers share with students the value of rapid positioning possible with kinematic systems, giving examples such as relief following natural disasters or monitoring geologic hazards. This introductory unit is appropriate for upper division geoscience, earth science, geography or civil/environmental engineering students who have already been introduced to basic concepts such as plate tectonics, mass movements, and hydrology. Students should also have a first-order familiarity with uncertainty, precision, and accuracy and the science behind GNSS systems (Unit 1: GPS/GNSS Fundamentals). Appropriate for academic year courses with field components or a summer field camp. This unit builds upon Unit 1's fundamentals (such as GNSS systems, precision, accuracy and uncertainty) and assumes that users have either completed Unit 1 or had previous training in GNSS concepts and terminology. This unit is designed for a mixed classroom/field setting. However, we encourage that the initial presentation of material occur in the field with hands-on demonstration of kinematic GNSS equipment. Students should be encouraged to use printed handouts for note taking. The final portion of the unit requires a computer with GNSS processing software appropriate to the brand of hardware used and an internet connection. This can be done on a field laptop, if desired. This unit is a prerequisite for Unit 2.1: Measuring Topography with Kinematic GPS/GNSS and Unit 2.2: Change Detection with Kinematic GPS/GNSS, which apply the methods learned here to a particular scientific application. It is perfectly fine to do just one of the application sub-units -- either Unit 2.1 or Unit 2.2. An initial lecture and discussion (45 minutes) guides students through kinematic GNSS. 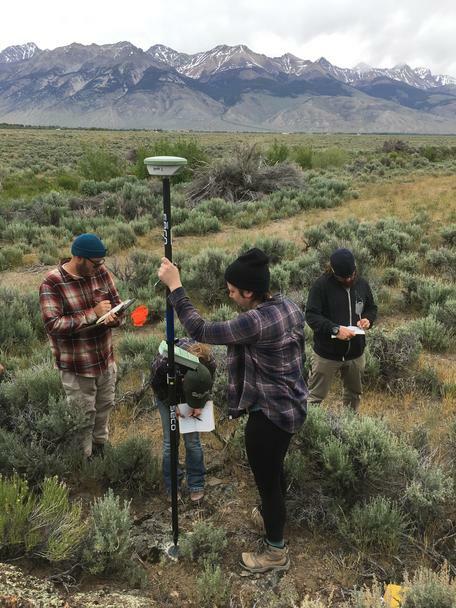 Students are introduced to the conceptual purpose of a kinematic survey, and its merits and applications in the geosciences. A significant portion of the lecture focuses on survey design and field deployment considerations. Students need to consider complications such as line of sight, radio range and attenuation, multi-path errors, and terrain shadowing. Students learn how these various components affect accuracy, precision, and error in their measurements. Students are next introduced to the structure and content of the Kinematic GNSS Survey Methods Manual (15 minutes). This can either be done in the classroom or in the field and incorporated with the subsequent section, depending on equipment and instructor availability. Students are guided through site selection and setup of an RTK* base station and rover including hardware, power, and software components (1 hour). The instructor uses the Kinematic GNSS Survey Methods Manual to guide this introduction. Students familiarize themselves with the components and are given appropriate individual time with the equipment, especially if you plan to teach Units 2.1 or 2.2. Students should also be given ample time to collect test data and experience what happens during suboptimal conditions: lack of sky view (such as under a tree), where multi-path errors are common (next to a building), or a rover losing line of sight/communication to the base station radio. This section requires field environment to collect GNSS data, but could be marginally adapted for indoor environments in adverse conditions. *This section can be done with a Post-processed Kinematic (PPK) system, but RTK systems have additional components that students should learn about as well. If you are teaching Unit 2 and 2.2 only, a PPK system is appropriate. If so, students should still be instructed in the pros and cons of using a real-time system with radios and the differences between the two setups. PPK systems are not as adept at illustrating some potential field issues, such as failed radio communication. Students use the data processing manual and a demonstration of appropriate software to correct the position of an unknown base and apply that correction to rover points (1 hour). This is best done in a classroom environment with computers after survey data has been collected. Students learn how kinematic processing varies from other methods. Students may need specific manuals on post-processing, depending on the hardware/software available to the instructor or proprietary to the equipment used. We cannot provide these, as each manufacturer's software is unique. In general, students will work through the preparation of a RINEX (Receiver Independent Exchange Format) base station file and process it using the OPUS (Online Positioning User Service) website to give a corrected position. Students then apply the corrected base position to their rover data. Students are assessed on their capacity to answer a science question via the design and execution of an RTK topographic survey. Instructors assess learning via observations of student effort/participation and individual maps/plots and written reports. In total, this takes ~4-5 hours depending on the complexity of the science question selected. The assessment begins with the introduction to a survey site and a student-led discussion defining a relatively simple, science question. Students then (1) design a survey that answers the question, (2) execute the survey with proper field note-taking, (3) post-process the base and rover data to generate the required data/map and (3) answer the science question initially posed and write a short summary on how and why survey design decisions were made and whether they were successful at answering the science question. Presentation:Basics of kinematic GNSS and post-processing workflow. Single pptx file for Units 2, 2.1, and 2.2. Summative assessment: integrated field survey, assignment, and assessment. Checks for student comprehension of kinematic system principles before moving to the applied uses in Unit 2.1 and 2.2. This unit requires a fundamental understanding of GNSS systems and their applications. It will be most effective for users to have completed Unit 1: GPS/GNSS Fundamentals first. The most critical objective is to provide hands-on, outdoor experience with the kinematic equipment. It is best to integrate the learning of materials in the methods manual with a physical setup of a GNSS base station in the field. Students should be highly encouraged to take notes within the manual or on separate paper as needed with the expectation they will perform the next survey as independently as possible. It is most effective for instructors to have coordinated the field questions and locations prior to teaching. Surveying some of the suggested points in the assignment before the class session provides students with data to work with regardless of their success in the field. Students should be given a site that provides them an opportunity to complete a basic survey and that challenges them to think about various elements of survey design. This should include a few challenges such as line of sight, multi-path errors, limited sky and satellite geometry, etc. The survey target can be as simple as measuring the geometry of a structure like a sidewalk. A simple geometrical target will help students assess whether the survey was successful. Keep in mind that if the base station will be set up over an unknown point, the base must record a minimum of 2 hours of data to process a high-precision static location via OPUS and should ideally run for 3–4 hours or longer. However, due to time constraints for this assignment, a much less precise position can be established with an occupation of 15 minutes or more, but this will affect the accuracy of every point taken with the rover. Be sure to get landowner permissions. Most counties publish online parcel maps to help identify landowners. Students should be aware that GNSS surveys are about precision, and that includes detailed metadata notes about the setup. Additionally, the learning should focus on the physical setup, diagnostic, and troubleshooting of the equipment. Students should be encouraged to take personal notes directly in the manual, as they will use this document to perform their survey in Unit 2.1 and/or Unit 2.2. Students are encouraged to note when they encounter issues and how they resolve them. One of the challenges of integrating GNSS surveys into a course with more than a few students is making sure that students stay engaged and mentally challenged even while they are waiting for their chance to participate in the data collection process. Students should also be encouraged to create a sketch map of the features of the survey area and where data were collected to ensure they can complete the data exploration portion of their assignment. Breaking students into small groups and conducting multiple surveys if multiple rovers are available is great. Most systems allow multiple rovers to operate with a single base station. An example field log is provided, and students are encouraged to fill this out or create their own. Metadata such as equipment type, manufacturer, and important settings should be recorded. Additionally, and equipment log is provided and can be used to engage students while they are not taking points. If there is time prior to taking students in the field, have them find the feature of interest on Google Earth. This way, they can assess the scale of the feature and use this in planning. The data processing section of this unit requires proprietary software from the manufacturer of the GNSS system you are using, often resulting in limited licenses. This section of the unit may be modified based on resources available. If no student computers are available, we encourage the instructor to project their screen and walk through the data processing and exploration with students. It is imperative that you know and understand the processing instructions for the manufacturer's software you will use. The basic workflow is the same, but names and locations of functions differ. In a pinch, base station corrections, the difference between the original position and the OPUS result, can be applied using basic math, by subtracting the static offset between the two coordinates from the rover positions. This solution is highly discouraged, as it is not a robust solution. It is not recommended to share this with students, as they should be encouraged to do all processing the appropriate software if at all possible. The OPUS portion of the processing (processing base station position) is freely accessible on the web for students to practice. This requires connection to the internet. For remote field camps without internet, it is best to predetermine the coordinates for your base station locations. The formative assessment is observation of and discussion with students about the survey. This can be done individually, paired, or in groups, depending on instructor preference. This should be done periodically throughout the process to help gauge student understanding and weaknesses that can be addressed before they are tasked with their own survey. Additionally, students should engage in a discussion about how RTK techniques could be applied to various problems, such as measuring landslide velocity or river incision with respect to risks posed to a road, house, or other infrastructure. Summative assessment for the unit is based on the completion of the student exercise and is graded by the accompanying rubric. Students are to complete a sketch or map of the survey, fill out the equipment list, take proper field notes, write a summary of the study, and address the provided questions. The students should be prompted to discuss the success of the study, the obstacles or errors that contributed to loss of accuracy, and how this or a similar survey could be used to answer a scientific question. P. H. Rydlund, Jr. and B. K. Densmore, 2012, Methods of practice and guidelines for using survey-grade global navigation satellite systems (GNSS) to establish vertical datum in the United States Geological Survey: U.S. Geological Survey Techniques and Methods, book 11, chap. D1, 102 p.